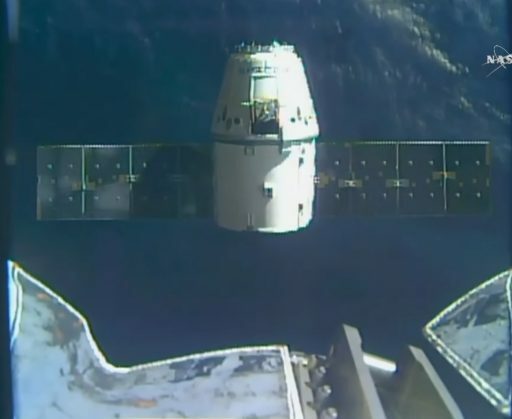 The Dragon spacecraft was buttoned up on Saturday ahead of an overnight unberthing to set up for an early departure on Sunday, being set free by the Station’s robotic arm at 9:11 UTC to begin the multi-hour return process. Breathing fire after sitting quietly for a month, Dragon entered an independent orbit where it will open a gap to ISS ahead of firing up for its deorbit burn at 13:55 UTC to set up for a blazing re-entry en-route to splashdown at 14:52 UTC. 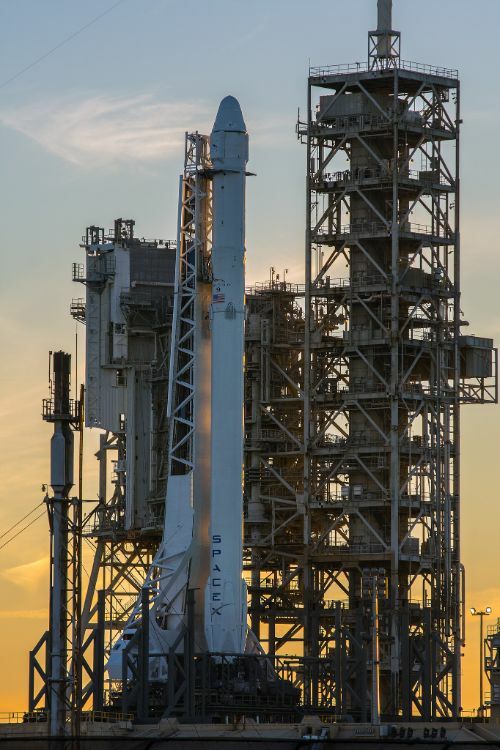 The Dragon lifted off atop a Falcon 9 rocket back on February 19 on what was expected to be a three-day rendezvous with the Space Station that turned into a four-day flight profile when Dragon’s first link-up had to be aborted due to a software-related issue. Captured by the Station’s Canadarm2 on February 23, Dragon was opened for business later that day when the Space Station crew opened the hatch to access 1,530 Kilograms of hardware delivered inside the craft’s pressurized section while a pair of external payloads, amounting to nearly one metric ton of cargo, was set for robotic removal from Dragon’s Trunk Section. Dragon’s three-and-a-half-week stay was particularly busy, inside and outside the Space Station with the crew tasked with removing cargo from the spacecraft, conducting a series of scientific experiments and putting them back into the Dragon among other return items while the Station’s robots were busy dealing with external payload moves. 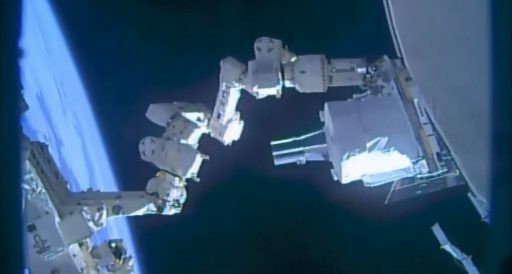 With a packed robotics schedule outlined for Dragon’s stay, ROBO specialists wasted no time and put the Station’s robotic duo, the 18-meter Canadarm2 and the two-armed Dextre robot, to work on February 26 for two days of overnight work designed not to disturb daytime ISS operations. 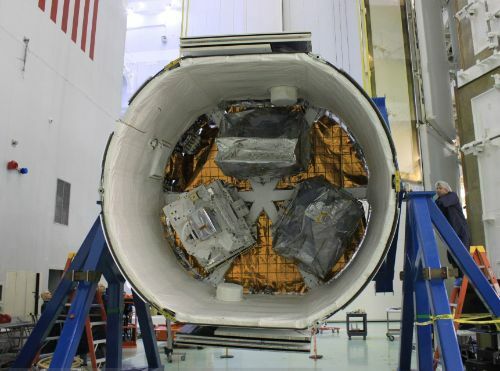 The first payload pulled out of Dragon’s Trunk was the Space Test Program – Houston 5 pallet that hosts 13 different technical demonstrations ranging from a lightning imager, a navigation system pathfinder and in-space processing technology to materials science studies and a structural health monitoring investigation. 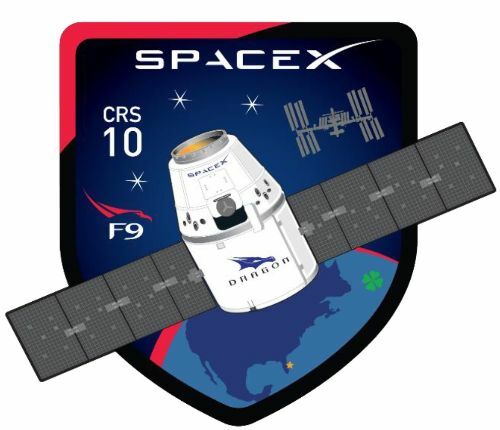 STP-H5 was installed on Express Logistics Carrier 1 on the port truss of the Space Station, taking the place formerly occupied by OPALS, the Optical Payload for Lasercom Science, that launched on the third operational Dragon mission in 2014 and will find its fiery end on aboard Dragon SpX-10. OPALS was active for a four-month test mission to validate technology for high-data-rate laser communications between spacecraft and ground stations, delivering a number of lessons for the improvement of the technology before introduction into operational service. With STP-H5 in place and OPALS stowed in the Trunk, the next robotics activity picked up on March 2 and lasted until March 8 to install the SAGE-III atmospheric-monitoring instrument – requiring three distinct steps. 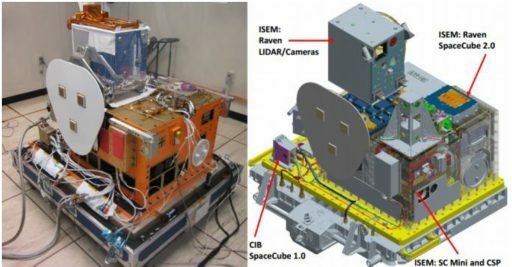 The first step was the removal of SAGE-III and its L-shaped Nadir-Viewing Platform (NVP) from the Trunk, removing the Robotic Refueling Mission (RRM) payload from Express Logistics Carrier 4 out on the Starboard Truss and then putting the NVP in its place followed by the installation of SAGE in an Earth-pointed orientation. SAGE-III is set for an open-ended mission, monitoring ozone and aerosols in Earth’s atmosphere to continue a long-term data record going back into the 1980s when SAGE instruments provided pivotal data enabling an accurate calculation of ozone loss in the atmosphere that prompted major policy changes to protect Earth’s ozone layer. 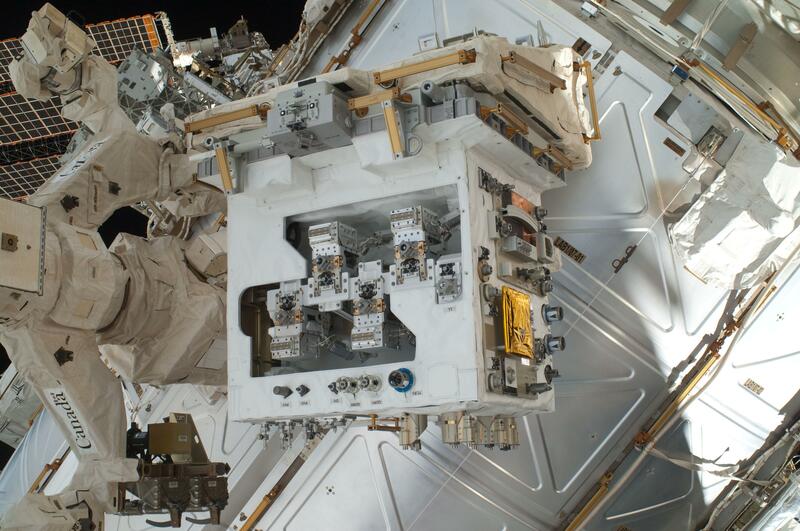 On March 13, Dextre removed a payload bracket from ELC-2 once used to hold a Materials International Space Station Experiment (MISSE) payload. The MISSE FSE was then placed in Dragon’s trunk followed by stowage of the RRM to fill up all three disposal slots available in this particular trunk configuration. 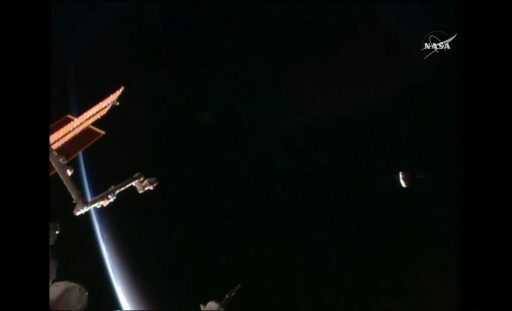 The Robotic Refueling Mission was delivered to ISS by the final Space Shuttle mission in 2011 and completed several rounds of key demonstration tasks to gather data on the feasibility of in-space satellite refueling and other maintenance tasks such as manipulating blankets and repairing electrical systems. Its tenure on ISS is coming to an end on Sunday with a fiery re-entry as Dragon’s Trunk and all its contents do not enjoy thermal protection like the Dragon itself and burn up upon entry into the atmosphere. The the ISS robots were working overtime on the exterior, the crew had a busy schedule dealing with a large number of experiments delivered by Dragon and booked for return aboard the same spacecraft. Riding into orbit aboard the Dragon was a group of 20 mice for a study of how bone tissues regenerate in the space environment under different treatments to collect knowledge on how the space environment can affect bone repair. As with previous Rodent Habitat studies, the mice did not have a return ticket and instead harvested samples will ride back to Earth as part of cold stowage for later laboratory analysis. 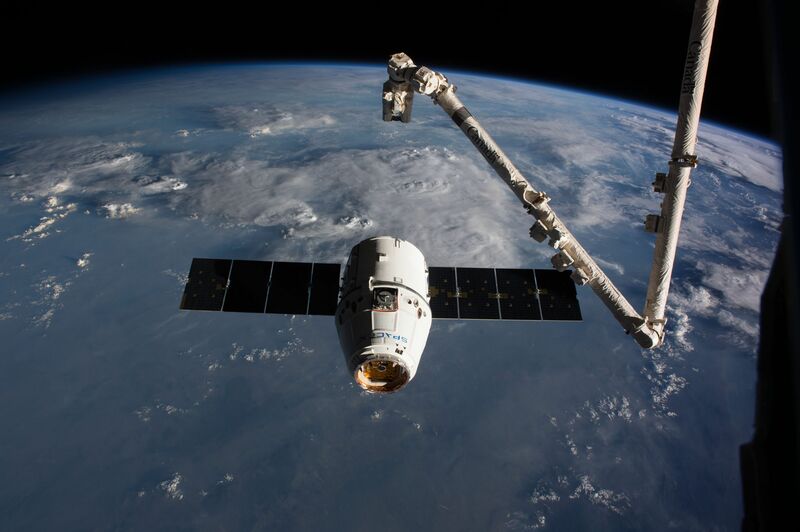 Other time-critical studies on the Dragon look at methods of preparing stem cells for use in medical treatments, protein crystal growth in microgravity and viral mutations in the space environment. These experiments were completed over the course of Dragon’s stay before being placed in cold stowage prior to return to gravity to preserve them. As the only vehicle capable of returning meaningful cargo to the ground, Dragon offers a valuable opportunity to empty out the Station’s laboratory freezers that fill up with all kinds of samples ranging from crew samples for dozens of medical studies to frozen plant parts and cell cultures which are eagerly awaited by scientists on the ground for laboratory analysis. Dragon’s return cargo, around 2,450 Kilograms for this mission, comprises science experiments, systems hardware for inspection and refurbishment, and no-longer-needed items from the orbiting outpost including the external payloads. 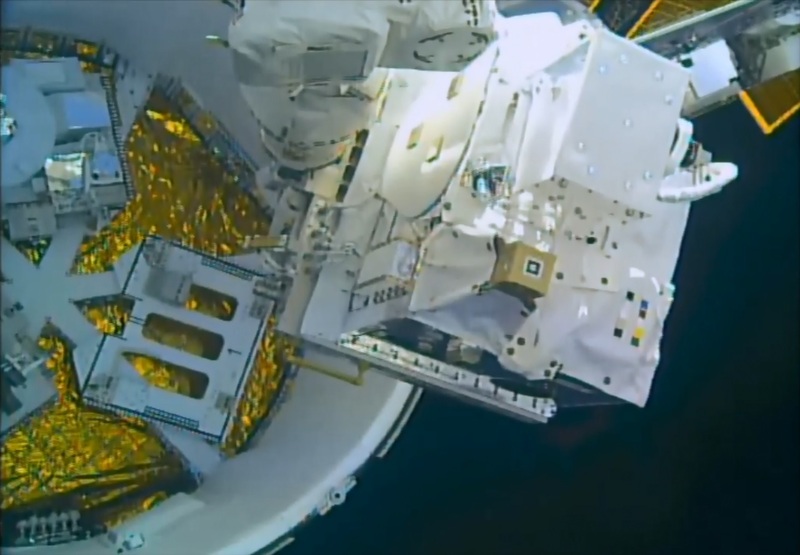 The final time-critical payloads were placed aboard the Dragon on Saturday, stored in Double Cold Bags to remain in a thermally controlled environment through their return to Earth. The USOS crew members then buttoned up the Dragon, making sure all return items were secured in place before closing the spacecraft’s hatch and completing the lengthy vestibule outfitting task to remove data and power jumpers and put in place four Control Panel Assemblies needed to drive the bolts holding Dragon in place over the course of its stay. After the Harmony module hatch was closed, the vestibule between ISS and Dragon was depressurized for a leak check before the go was given for the unbolting of the Dragon. Four groups of four bolts were released and capture latches opened to demate Dragon from the Earth-facing port on the Harmony module at around 21:20 UTC on Saturday. 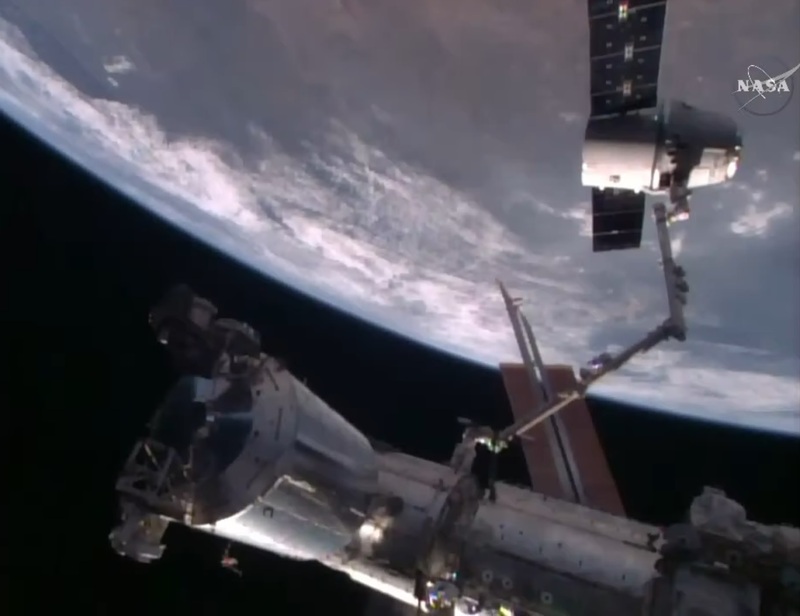 Under the control of Canadarm-2, Dragon was moved to its release position in the overnight hours to be in position when the crew got up on Sunday. 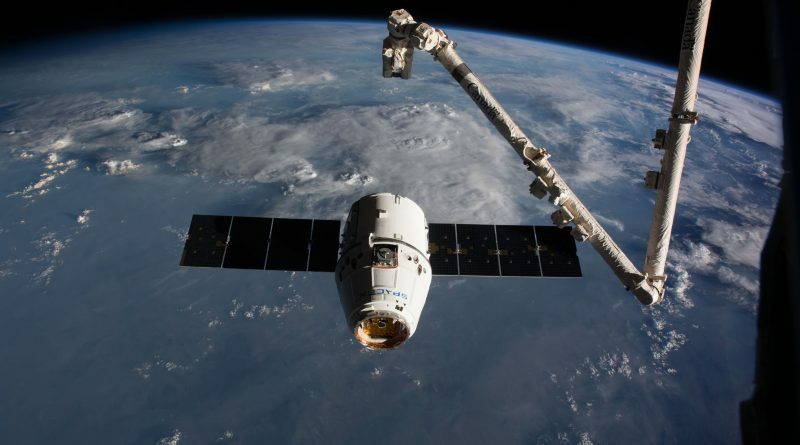 Mission Controllers in Houston and at SpaceX’s facility in Hawthorne confirmed that Dragon was ready to be released with its thrusters initially inhibited to allow Canadarm2 to back away prior to the craft’s first departure burn. Receiving the GO from Mission Control Houston and MCC-X in California, Expedition 50 commander Shane Kimbrough and ESA Astronaut Thomas Pesquet got ready to ‘pull the trigger’ – that is initiating snares to open in the Latching End Effector of Canadarm2 to release the Flight Releasable Grapple Fixture on the Dragon. Dragon was set free on time at 9:11 UTC and the robotic arm was moved to a safe standoff before Dragon recovered from free drift for a very small departure maneuver three minutes after release, initiating a slow downward opening rate along the R-Bar or radial vector. The second departure burn came 90 seconds later to accelerate Dragon’s departure. On its traverse down the R-Bar, Dragon departed the Station’s Keep Out Sphere and fired up for its third and largest departure burn 12 minutes after release that set the spacecraft up to depart the Station’s Approach Ellipsoid, ending the integrated operations phase between MCC-X and Houston with SpaceX in charge of bringing Dragon home to a safe landing. Departing the orbital outpost, the spacecraft will be on a path to increase its range to the complex to around 150 Kilometers over the course of the Free Flight. 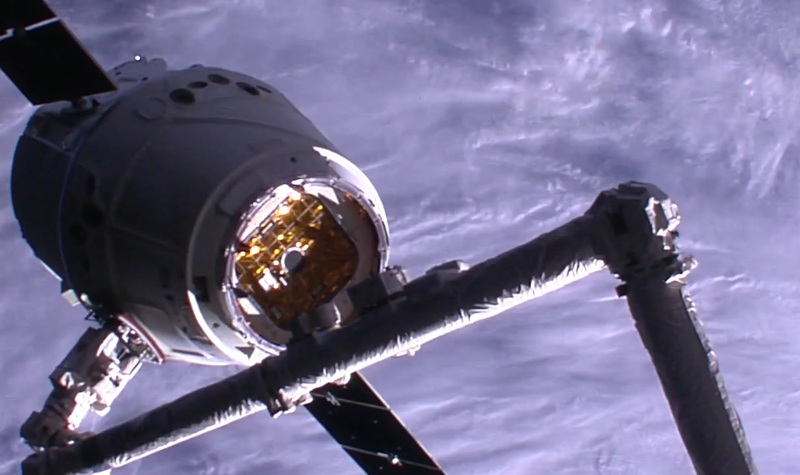 The vehicle will spend nearly five hours in Free Flight to set up for its deorbit burn that has been precisely calculated to allow Dragon to make an on-target landing. One of the critical events of the Free Flight is the closure of the GNC Bay Door to protect the navigation sensors inside from the harsh re-entry environment. Dragon will begin firing its Draco thrusters at 13:55 UTC for a precisely targeted deorbit burn that will be nine to ten minutes in duration to slow the Dragon down by around 100 meters per second, placing it on a path to intercept the dense atmosphere at a location that allows Dragon’s Entry Guidance System to maneuver the craft to the desired chute deploy position. 16 minutes after the start of the deorbit burn, Dragon will jettison its trunk section containing the solar arrays and external payloads to burn up in the atmosphere. Around 20 minutes after the conclusion of the Deorbit Burn, Dragon will begin re-entry, hitting the dense layers of the atmosphere. During the Re-Entry Process, Dragon’s PICA-X Heat Shield has to withstand temperatures of up to 1,600°C, making use of an adaption of NASA’s phenolic impregnated carbon ablator heat shield. This heat shield has a substantial flight heritage and the PICA-X version is expected to be re-usable many times without showing a high degree of degradation. 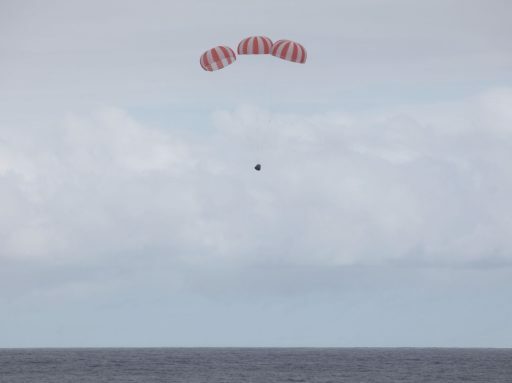 About 10 minutes before Splashdown, at an altitude of 13.7 Kilometers, Dragon opens its dual Drogue Chutes slowing the vehicle down for the opening of the three orange-and-white main chutes around three Kilometers in altitude. Flying under the Main Chutes, Dragon is slowed to its landing speed of 17 to 20 Kilometers per Hour. Splashdown is expected at 14:52 UTC in the Pacific Ocean, 400 Kilometers west of San Diego, California where recovery forces will be awaiting the arrival of the vehicle. 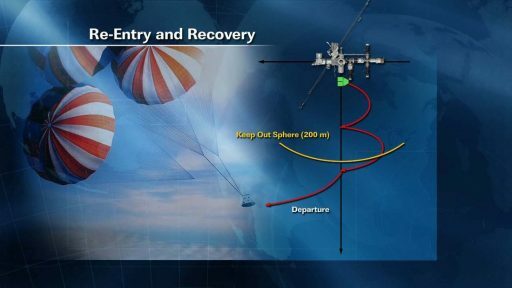 In previous cases, Dragon’s landing was very close to the bulls-eye target, allowing teams on the recovery ships to track a large portion of the vehicle’s descent under its three main parachutes. After being recovered from the ocean, Dragon will be brought to the Port of Long Beach for initial post-saving steps and the removal of time-critical cargo from the spacecraft. 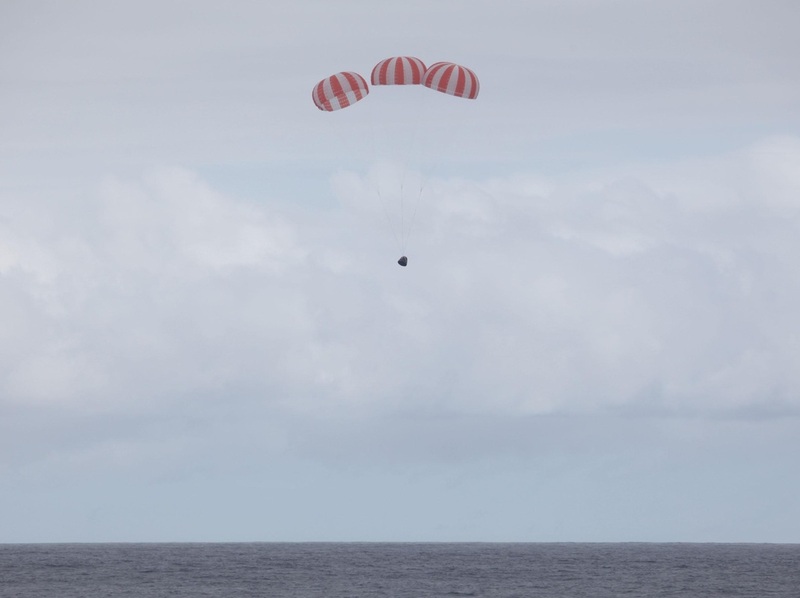 Critical cargo retrieved from Dragon will be shipped back to NASA within 48 hours of landing for post-flight analysis and distribution to the participating scientific institutions. ISS is awaiting its next shipment of supplies next week as Orbital ATK’s Cygnus OA-7 spacecraft, christened the SS John Glenn, is set for liftoff as early as the night of March 23/24 atop an Atlas V rocket to send 3,460 Kilograms of supplies on their way to the orbiting complex.